4. Relocated somewhere sunny? Get settled into a new beginning! An international move with us can be organised only after a thorough inspection with a professional surveyor has taken place. Just get your appointment pinned for a day when you have the time to discuss all your needs and specific requests. The removals expert will note down all the information required to plan the process of moving to Europe from UK. Soon after, we will send you a free, no-obligation quote with a detailed breakdown of the cost. You can always make alterations to your booking and ask for additional assistance before moving day arrives. You will have to provide the international movers team with a sufficient parking space (6-8 metres per van). The international house removals specialists will get on with the job, according to the customised plan, they have devised with you in advance. They will make an inventory while packing securely your belongings in moving boxes and quality packing materials. They will also label accordingly each package for extra clarity. Furniture will be dismantled, if applicable, soft items will be protected with a cover and other bulky furniture will be boxed or wrapped in removals blankets. Your movable property will be loaded with care in the vans and all measures will be taken to secure each piece safely with ropes. The load will be transported under full international moving insurance if we do the packing of your goods. Make an additional request for a packing service and don't worry about mishaps or damaged items. The international movers and packers are seasoned drivers and have years of experience travelling on international roads across EU borders. They use reliable navigation and will take the most direct route to your overseas destination. The Fantastic pros are quick at problem-solving should they come across road repairs or unanticipated traffic jams. This means that they will do their best to deliver your belongings in sync with the pre-planned schedule. A parking spot at the delivery location is also a must and this is your responsibility. So, to avoid delays and inconvenient events in a foreign country, do your homework and contact the relevant authorities if needs be. Upon arrival of the removals vans, you or a representative will be expected to be present on site and instruct the technicians during the unloading process. Each box and piece of furniture will be placed in their designated rooms. The international movers will unpack everything and piece disassembled furniture together if this has been included in the international house removals service. After all, this is the only way that you could inspect the condition of your belongings while the removals operatives are still present. 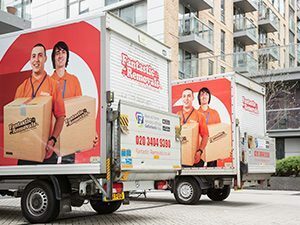 Fantastic Removals will provide you with anything you may need from an international removals firm so you have more free time to focus on other important aspects of your move. Besides just transporting your items, we can provide you with moving materials, pack your possessions or keep them safe in a storage facility. We specialise in international house removals and commercial services from anywhere in the UK to any of the 28 member-state countries in the European Union. We can also relocate you from Europe back to the UK. Note that all ferry/bridge crossing fees and highway tolls/road taxes will be included in the final price. You can be assured that your items are safe with Fantastic Removals. Our international house removals services are performed by trained and overseas movers. Also, to be on the extra safe side, they have public liability insurance. In order to make your removals experience a lot more easier, we have a video survey option. You just use your mobile device and take us around your property during a video call. This way, we can give you a much more accurate quote for your international furniture removals service and it takes just ten minutes or so. Make your international move even more affordable by becoming a Fantastic Club member. For a small annual fee, you will get a guaranteed 10% discount on 25+ services, as well as member-reserved booking slots. With our GoFantastic app, you will also benefit from our discounted rates no matter where you are. If you are choosing the Spanish laid-back, slow-paced style of living over a stressful existence in the UK, we can only envy you. Depending on what area you are relocating to, your belongings can be delivered in approximately 24 to 36 hours to most coastal towns in Spain. Brits usually move for good to Barcelona, Murcia and Malaga or seek employment opportunities in Madrid. Note that the Spaniards can be way too relaxed, so watch for their ‘Manana’ response, especially when you try to sort out the parking. Although historic rivals, many British turn a blind eye to their slight dislike of the French and eagerly relocate to Brittany, Lyon or down south to the coastal cities of Nice and Marseille. As Paris could be as expensive as London, it isn’t usually a relocation choice but rather a work-related destination. With our international removals company you will easily get your items to France within 12 to 24 hours. Better polish on your French as the local folks will refuse to communicate in English at all costs. Expect to follow the rules in Germany, whether you are extending your business to Berlin or want to start a family in Munich or Frankfurt. We will transport your movable property in 24 to 36 hours, depending on the city you are moving to. Our advice to you is to get into your thick skin as quickly as possible, as customer-orientated approach (when it comes to services in Germany) is a somewhat rare beast. Also, expect red tape in every endeavour to get permission or receive an important document. It will take us about 46-48 hour to help you taste the healthier lifestyle, fresh local food and sunny climate of Italy. Whether the rolling hills of Sardinia took your fancy, you picked Umbria or Sicily to be your home from now on or moving to Rome has been a lifelong dream of yours, get ready for adventure! Learn fast to open up and wear your heart on your sleeve and you’ll fit in nicely with the temperamental and often, overdramatic Italians. It's easy to move to a European country if you have citizenship in the UK. If you don't have one and have been born in a country out of the EU, see the visa requirements in the country you're heading to. International removal companies will not do this type of research instead of you, it's a step before the house move that you'll have to complete on your own. Before making the final step of booking the international removals service, make sure you'll be able to deal with the cost of living abroad. The quality of life is related to the costs of living, which may turn out to be higher than you expected. Living there is part of your total international moving costs. You won't be leaving your pet behind unless the customs agent find an issue with the animal. Learn all regulations related to passports and vaccines before getting to the border. If you have kids who're currently going to school, make sure to notify the school that you're moving abroad. As parents, you will probably be asked to fill some papers. Q: Is your international removals service insured? A: Yes, moving to a country in the EU is covered by the “goods in transit” insurance. Insurance for moving to countries outside of the EU has to be arranged separately. Q: What if I haven’t got an address yet in the country I’m moving to? A: We can provide you with a removals and storage service as well. It will help you with securing your belongings in a storage facility in the destination country until you are ready to move to your new property abroad. Q: How long in advance I need to contact you before moving day? A: Moving to a different country requires planning, so we recommend that you book a survey with us well in advance. Some clients choose to discuss the process and learn about the cost of the service as early as 3 months prior to moving day. But we can organise everything at a much shorter notice, too. Q: Do you provide international removals services to countries outside the EU? A: Presently, we only offer European removals options. However, in the future, we do plan to expand our overseas moving solutions worldwide by working with trusted partners in this sector. Q: Can I pack myself? A: In some cases, yes, but we prefer to include the packing in your service due to the potential risk of damage to your belongings as moving furniture overseas is sometimes harder than expected. Also if you unknowingly pack something that you should not import, our removals teams may face problems with the customs authorities. A: Our European house removals services are quoted at a fixed price. We will tailor the service and calculate the costs, based on your specific circumstances. A 50% deposit is required for all overseas international moving jobs. Q: Are there any additional charges I should know about? A: We strive to factor in every possible moving cost that might occur during your international relocation. However, certain third-party charges (local inspection fees or import duties) can be only guesstimated. Book Your International Removals Today!